Thelma Parkss story, written in her own words, is one of compassion and courage and steadfast faith. Born on a sharecropping farm in Louisiana, raised by a single mom during the Great Depression along with seven brothers and sisters, Thelma learned that love begins at home. She was baptized at fifteen, and the God she chose that day began to walk with her day by day. She looked to Jesus as an everyday example of how to love and treat one another. In her adult years, she modeled a steadfast desire to follow Jesus and His ways. Experiencing the pain of racial prejudices, discriminations, and broken relationships, Thelma Parks, a quiet black lady, discovered the power of following His way of love. Thelma found her legacy through the pain and loss she experienced and overcame through a sincere love and forgiving heart. 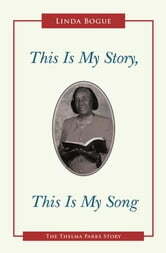 This Is My Story, This Is My Song: The Thelma Parks Story is filled with insights of the richness of Gods provisions and purposes. With simple yet profound words, this message of faith, love, and forgiveness can encourage and inspire. Discover God, the source of life who offers guidance and hope in your everyday life. Listen and learn the ways of God and live a life of lasting significance!